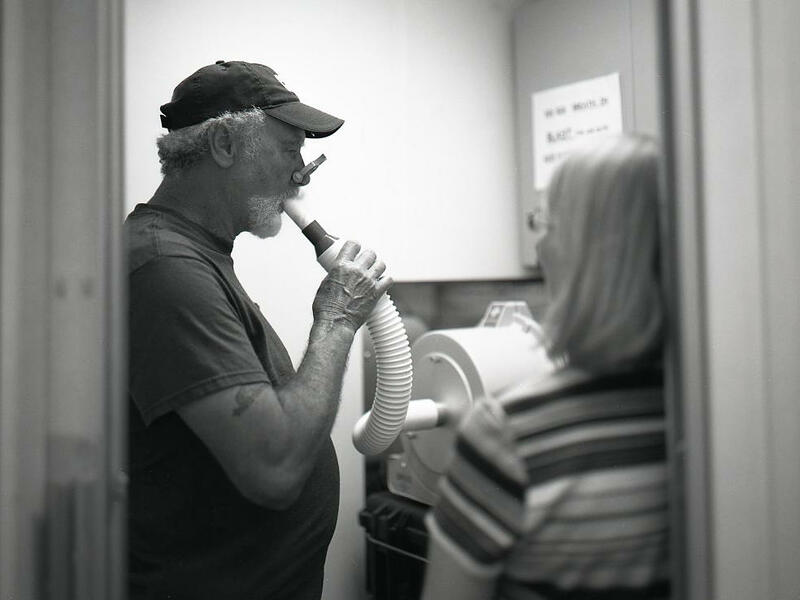 Coal miners are tested for black lung at a clinic in West Virginia. 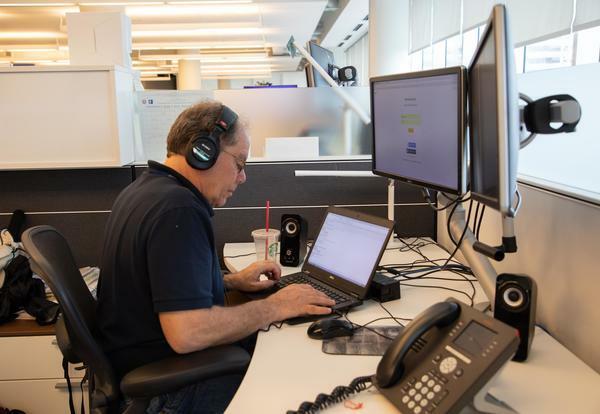 Behind the Stories features perspectives from the reporters, editors and producers who create NPR's content, offering insights into how and why they do what they do. 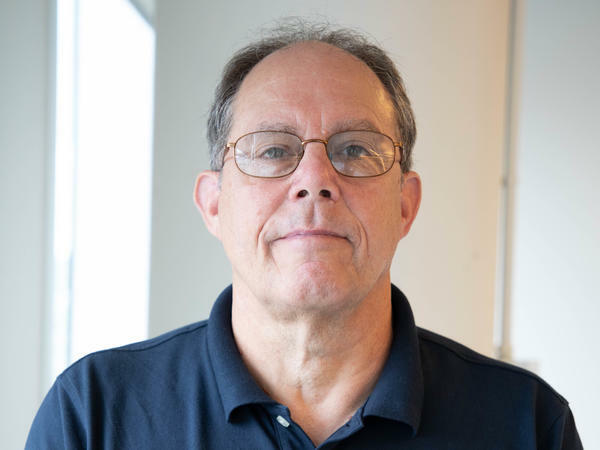 For this post, we talked with Investigations Correspondent Howard Berkes about his recent work on "Black Lung Returns To Coal Country," a series he has reported off-and-on for years. You've been on the "employers wronging employees" beat at NPR for a number of years. What about it is most compelling to you? I like to call it workplace safety and government regulations gone awry. It started with the Upper Big Branch mining disaster in West Virginia in 2010. I was on the National Desk and had covered a couple of coal mining disasters in Utah. I was NPR's first, maybe only, rural America correspondent, a beat I covered for ten years. Frank Langfitt was the workplace correspondent at the time and had also been covering mine disasters. He was covering the mine disaster in West Virginia and asked if I would join him to investigate what happened. I learned a lot about the failures of government regulation, weak laws, with workplaces and workers. That really piqued my interest. How long did it take for you to report the recent pieces in the series? And how did you go about finding sources from across the Appalachian region? All the recent stories are episodic. I started investigating the resurgence of black lung disease in 2012. That was an outgrowth of the Upper Big Branch mining disaster, because the autopsies of those dead miners showed an incredibly high amount of black lung disease in that mine, including among young, lesser experienced miners. I was interested in following that thread with Chris Hamby of the Center for Public Integrity, and in 2016 I got a tip about how the very high rate of the advanced stage of the disease was not being picked up by the government surveillance system that's supposed to track the disease. Within a few phone calls I had it nailed down. Over 5 years the government had tracked 99 cases. In half that time I surveyed clinics and came up with over 2,000 cases. Most of the new studies that have come out recently are confirming what we already reported, so I'm still working on the next big stage of the series, which I started working on in the fall. How did you cultivate your sources early on? It's especially difficult in Appalachia. People in the rural parts are suspicious of outsiders because they have been treated very poorly by national media over the years. They've been portrayed as stupid, unhealthy people, often because reporters come in with preconceived notions. However, because I've put in the time (I spent a year reporting on the mine disaster and made multiple trips and introduced myself to lots of people, even if they wouldn't talk to me, and I would keep in touch), I've gained their trust. Because they saw that I was serious they became inclined to talk to me. They know that if they tell me something, I'm going to do something with it. What piece of information or interaction with a subject surprised you the most while reporting for this series? It was pretty shocking to find that thousands of people with the worst stage of the disease were off the radar of the government agencies that are supposed to address that. It surprises me sometimes how much we can do as reporters by looking deeper, asking the right questions, and trying to find the right people. It's pretty surprising that as a guy based out of Utah, I found out these stories and local reporters didn't. What outcomes of the reporting in this series have been meaningful to you? Our reporting has changed the whole discussion about black lung disease. It's spurred government agencies into action, prompted legislation from Congress to increase the funding for black lung clinics, and caused advocacy of more strenuous regulations. It has brought attention to this disease in a way it wasn't getting before. There is an enormous amount of research underway as a result of our reporting and the confirmation of our reporting by government researchers. In the first story in the 2018 run of the series, you included this quote from a source: "I think it's a modern industrial tragedy because we have thousands and thousands of miners with debilitating lung disease that shouldn't happen and it's totally preventable." What might be a comparable situation that readers might be aware of? The severity of this disease is something that rivals what could be the worst workplace industrial disaster in American history—Hawk's Nest, a disaster that very few people outside of West Virginia know about. It was a situation where a company hired hundreds of workers in the 1930s, many of them poor African Americans, to dig a tunnel through a mountain of solid rock. The rock was quartz, and the dust they were producing was silica, which is much more toxic than coal dust. Hundreds of people died, some even stopped dead in their tracks because they inhaled so much silica dust. They dumped some of the bodies in the river because they ran out of space to bury people. The story was suppressed, there were congressional hearings about it, and now we have a story in the pipeline from Adelina Lancianese for this series. Is the state of workers rights as a whole better now than when you started this job? I'm not an expert, but what I've learned is that we have weak worker's safety laws under federal law. That hasn't changed at all. Change takes a long time. All I can do is raise awareness. In 2015 I did a series on worker's compensation laws, particularly in Oklahoma and Texas. We discovered a "race to the bottom," which led to workers being worse off in 33 states. We reported on a new movement at the time where employers and insurance companies were working to get workers to opt out of workers comp, something that was originally designed to help both workers and employers get good outcomes out of workplace accidents. This opt-out movement started in Texas and had moved to Oklahoma as a way for employers to get out of their responsibilities to workers. What Michael Grabell at ProPublica and I did was focus on the changing laws. We got a hold of all the companies filing these changes to plans, and we found that they directly violated state law. Because of our reporting on that, the movement is stalled, if not dead.